After much planning, we finally arrived early morning on 16th April at Incheon Airport. From there we proceed to take the AREX (Airport Railroad Express) to Seoul station, and then we transferred to Subway Line 4 and got off at Dongdaemun History & Culture Park station. Since we were way too early from the standard check-in time for our AirBnB accommodation, heavy/big luggage is an issue. 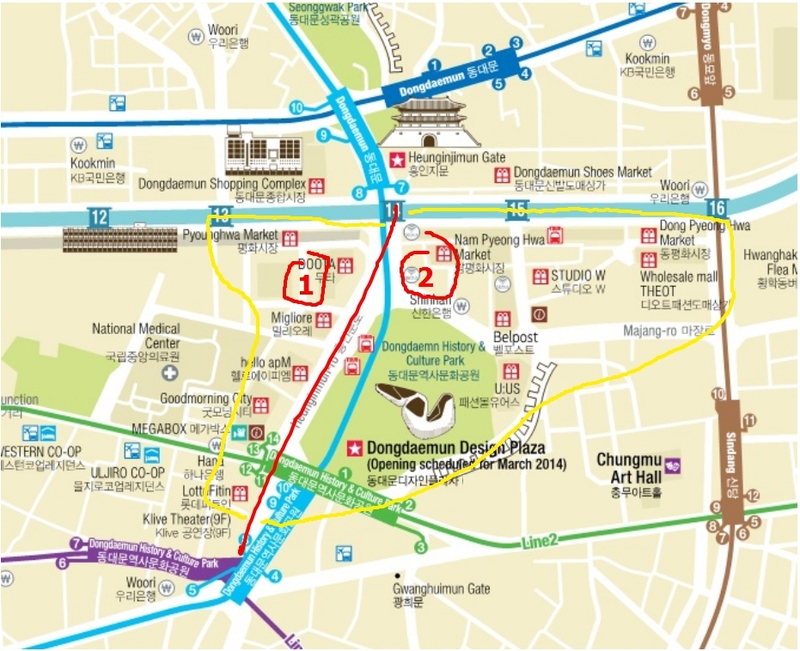 So if you find yourself in the same situation in Dongdaemun, take note that if you exit the station from Exit #11 or #12 Lotte Fitin mall is just next to the exits. On the ground floor, there’s a locker storage facility, if you can’t find it do inquire with the Inquiry booth near one of the entrances. The mall open at 11am so if your check-in is at 2pm or 3pm then it’s perfect, we stored our big luggage using the L sized locker for $1,500KRW for 4 hours. Lockers found in subways would cost around $4,000KRW for the same size and duration. If you are hungry during lunch hour there is a Korean buffet restaurant on the 7th floor which our host mentioned is pretty good but we didn’t get the chance to try them out. About 50m from Lotte Fitin is Time Castle building, on the 2nd floor is where you will find one of Korea’s favorite sweet snacks, Sulbing. It’s a bowl of shaved ice filled with sweet toppings. Opposite of Lotte Fitin is the futuristic looking Dongdaemun Design Plaza (DDP), a landmark in Dongdaemun. While chiling on the open area waiting for Lotte Fitin to open its door for business I noticed a Kakao store. KakaoTalk is a popular social chatting apps from South Korea, they have stores throughout popular tourist spots. LiNE app users, don’t fret, there are a few stores around Seoul as well. This is a small alley and can be easily missed if you don’t pay attention. There are dozens of grill fish restaurants along the alley, pick one and order away. Best to come around lunch time as we went at 8pm and only a few remain open so do take note. A must try for foodies. The grilled fish tasted fresh and oozes Omega oil. Near Exit #6 of Dongdaemun station, right above KFC (wait, wot?) is Kyochon Chicken, a chicken and beer joint. Finger lickin’ good *heh*. Definitely one of the best, if not the best, in their category. A must visit if you so happen to find one near your area. After so much walking and shopping you are bound to get hungry. We had supper twice in this small tent operated by two ajummas, next to Lotteria and right opposite of Time Castle building. Pardon my scribble on the map, not exactly world class. 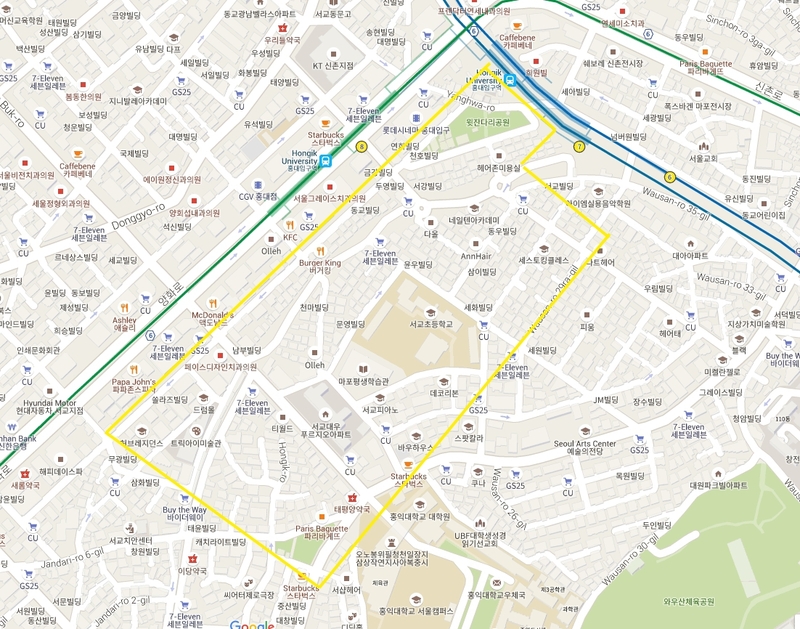 Dongdaemun shopping district can be divided into retail and wholesale. The map above shows (1) retail section and (2) wholesale section. Wholesalers only cater to retail customers buying in bulk so it will be hard if you only want to buy 1 piece. For retails you can bargain away, the force is strong in you! First off, I apologize for the unflaterring shots of the chicken soups, it came bubbling hot. I was hynoptized by the steams and went for it before realizing I forgot to take the all-important photos. This restaurant is very popular for its Samgyetang (ginseng chicken soup) and it’s best to avoid the usual peak hour as the queue can be very long. I recommend ordering their Pajeon (green onion pancake) as well. A short walk away from Tosokchon is Gyeongbokgung Palace, a good opportunity to walk off your lunch. We arrived at the right time, changing of Royal Guards was about to take place. You can easily spend 1-2 hours here if you take your time to explore the whole vicinity. It’s a big place. If you are looking for traditional Korean street food then Gwangjang Market is not to be missed. It is one of the oldest traditional markets in Seoul and it is packed with vendors and tourists alike. We came here for our late breakfast/lunch and we were spoilt with options. Sometimes too many of a good thing can be bad because we didn’t know what to eat! If you can’t go to Jeju island to try their black pig then Maple Tree House is your next best option. This is an upscale restaurant thus their price reflect that. It’s more of “out of curiosity” visit but don’t get me wrong, they taste fairly good. Myeongdong being the mecca for ladies around the world for affordable cosmetic care as well as fashion attires can be very pack and busy mid afternoon. I recommend going early in the morning when foot traffic is at “minimun”. However street food stalls aren’t available then. After our trip to Busan and Jeonju we headed back to Seoul and this time we booked our AirBnB host at Hongdae in Mapo district. Hongdae is a great place to stay because it’s filled with youngsters due to several Universities in this district, which means affordable clothings and food targeting this demographic! But there are also great family restaurants about and if you like Japanese Unagi then I highly recommend giving Pungcheon Eel a try. The eels are fresh out of the tank, grilled with light salt seasononing. They tasted insanely good! Ganjang Gejang is salted fermented seafood in Korean cuisine, and Ahyeondong Ganjang Gejang serves one of the best soy sauce fermented blue crabs in Seoul. The blue crabs were mildly salty and sweet, perfect with a bowl of white rice. The flesh were soft like jelly, it was so good we had to order additional servings! Next to the restaurant is Ahyeon Central Market, do take the time to search for homemade Korean Sikhye, a traditional Korean beverage made with barley malt powder and rice. It is delicious and refreshing. You should be able to find them displayed in 1 liter mineral water bottle (color resemble barley water). There are plenty of street food to be had as well as regular eateries with varieties of cuisines in this area. Lots of interesting small boutiques for the ladies. I highly recommend you exploring the drawn area on the map below. Spend at least a day or two here, at night the whole place comes alive with street performances as well as pop up market. If you find this post useful do Share and leave your comment below!